I didn’t get a Tony or an Oscar, I got a Jack and a Charlie. My future was acting…the bright lights of Broadway, a regular gig on Saturday Night Live… NOT a suburban address with a swagger wagon and PTA meetings. Dreams that big aren’t achieved without hard work and effort, and I was afraid of neither. Theater degree in hand, I headed to the Big Apple. I joined a conservatory there which helped to hone my acting skills and thicken my skin. I waited tables, worked retail, even had a one day stint as a foot model! Survival of the fittest in the Big Apple! Needless to say I paid my dues and auditioned until it paid off with my first acting job in a touring company. It wasn’t anything glamorous but it was a start and I was so excited (and ready to retire my apron). What happens when God tells you to take a right when you planned on going straight? I got the job in May but the tour was not scheduled to begin until August. My mom said,”Why don’t you come home for the summer?” What could happen in a summer? Then bam! Here comes Barrett! I don’t know if it was the parachute pants he was sporting at 80’s Night or the blue shots I was drinking…but I awoke in love with heart palpitations. I was go grateful to have unexpectedly met the man of my dreams. I floated on cloud nine for the rest of the summer and a week before I left for the tour, he proposed! I left for the tour and another one to follow. Trying to plan for our future, Barrett applied for jobs in NYC and I continued to audition for roles. But the passion and drive had shifted and a new future was emerging. I was moving toward the beginnings of the ultimate roles of my life: wife and mother. When you get married and have kids, you do things you swore you’d never do. Well, I live in my hometown. I sold my soul twice and drive two minivans. My husband and I have two hilariously wild boys named Jack and Charlie. These two keep both of us on our toes! I never know what those two are going to say or do. Being a wife and mother has been the best thing to ever happen to me! It’s changed me as a person. I love every minute but I still wanted to act. I went to a retreat and we were all asked to share what we wanted God to do in our lives. I had no idea what I was going to say, but when it was my turn, it all came out. I told these strangers the struggle inside of me. I loved my family. I loved my life. I wouldn’t change it for the world. However, I still had a dream. I just didn’t know how to still pursue acting and have a family. It just so happened that there was a lady in the group that was the theater director of the church. She told me that this was a season. She too had a dream of acting but it didn’t happen until her children were grown. It never occurred to me that this might just be intermission. I wouldn’t’ be driving a minivan forever (Praise the Lert!) The internal struggle between who I believed myself to be and who I had become was destroying my peace and holding me back. She told me using my talents for the Lord was such an awesome experience. I surrendered all of my dreams, goals, and expectations to God. I asked God what His purpose was for my life. After Barrett and I got married, my Father in law told me of Granny Gertie. Granny Gertie was Barrett’s crazy Grandma that lived in the attic. They put off introducing me to her for fear I might not marry Barrett. Now that our marriage certificate was signed, I not only got to meet her, but she would be moving in with us. Thankfully, he was yanking my chain. That story however, was my inspiration for Granny Gertie. Granny Gertie is a crazy little lady that walks a little funny and steals funny sayings my real Granny used to say. 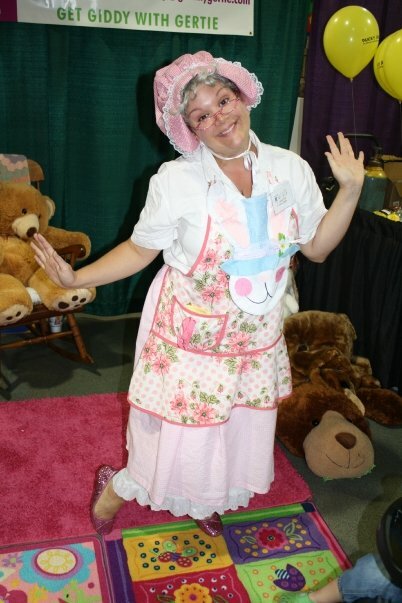 When she is not at the bingo parlor, Granny goes to schools and festivals and performs for little children. As Granny Gertie, I have done some really cool things. I have performed in inner city schools, country schools, even prison. Being this character of Granny breaks racial boundaries and allows me to connect with people whose background is totally different from my own. It’s always interesting to see people’s reactions toward me when I am no longer in costume. One day at an Angel Tree (an organization that provides presents to children whose parents are incarcerated) party, I spent the whole day hanging out with this one family. At the end of the day, I changed out of my costume and went back to hang out with this same family. I was a little hurt when they stared at me like who the heck is this white girl acting like she is our friend? They didn’t recognize me and I was no longer allowed in their world. Dressed as Granny, these kids tell me their dreams, hug on me, even ask me to pray for them. They let me into their world. I think it’s really cool how God has shown me how I can use my talent for something bigger than me. I got involved in prison ministry which is something I thought I never would do. The prison ministry is called Forgiven Ministry. They have one day programs set up for the kids to spend the day with their incarcerated parent. I am one of the entertainers. I am dressed as Granny all day. It’s quite frightening for these kids to be at the prison. For some of these kids, it’s the first time they have met their father. In the beginning, it is quite awkward and some of these kids hang on to me for dear life. In the eyes of these children, I am not a stranger. I am not a character. I am Granny and they need me around. Over the years, there has been a huge shift in me. My dreams in my 20s were all about me. Surrendering my dreams to God was the best thing I ever did! In case your life starts to change and you end up somewhere you never thought, before you start to beat yourself up for not achieving what you set out to, ask God what his plans are for your life. You won’t be disappointed. In a play, pacing is very important. If the pace is too slow, the audience will go to sleep or not come back after intermission. If the pace is too fast, the audience might miss the whole point the author is trying to convey. God, the director of life, paces things differently. I am thrilled that he slowed my life down during the period of my kids growing up. As the saying goes, they are only little once. I look forward to Act III. Hi Jill, thanks for sharing! I had exactly the opposite journey, but similar approach led to an outcome of serenity. All I ever wanted to be was a stay-at-home Mom. I put my husband through college so that he could provide for our family, and I could stay home. But he never did earn a stable living, so I worked… always anticipating that the day would finally come when I could be with my babies full-time. That day never came. When my children were ages 12, 9, 5, 3, and 1… their Dad walked out. Vanished and hid from all of us. I was forced to take my career even more seriously so that I could provide for my family. I spent many years crying out to God, wondering why He hadn’t given me a good father for my children and provider for our family so that I could be that Mommy that I knew my kids needed. God equipped me with a keen intellect, creativity and inquisitiveness, educational opportunities, a very exciting career field (aerospace! ), emotional intelligence, and an extremely high level of energy; and because of these gifts, I was able to accomplish quite a lot. Many other women looked at my “cool” life with envy — but I felt I had been given the “booby prize”. My ultimate path to serenity was paved exactly as yours has been: via acceptance of the life story that God has given me, and faith that He is in charge of the outcome, hence it is the perfect outcome for me. I now know that I am the lovely creation of God, the apple of His eye, and a delight to Him. The other labels (“mother”, “grandmother”, “director”, “engineer”, “cyclist”, etc.) are only secondary; and while some are more meaningful and special than others, none replaces the woman that God created. I appreciate you sharing… it always feels great to see and share the journey with our sisters. Thank you! WOW! Thank you so much for your response! I think you need to do a blog!!!!! You are an amazing woman!!!! Your reply just made my day. I think it is no coincidence that God’s plan is different than ours. He knows we will have to ask for help!!!!! He doesn’t like it when we try to do everything ourselves. I hope Grandparent hood is full of baking cookies and playing at the park!!!! Awe Jill I loved it!!!!!! !